Richard Haag’s Modernist campus, the former Battelle Memorial Institute site, has kept its integrity for nearly a half-century. Today known as the “Talaris site” and conference center, the campus, an oasis of tranquility in the Laurelhurst community in Northeast Seattle, is the topic of early-stage development plans, which threaten the integrity of its Modernist design. Seattle’s Laurelhurst emerged from farm-like settlements to become a platted residential neighborhood in the early 1900s. Developed in tracts over its 100 year history, it was an early attraction to Seattle residents seeking less developed areas of the city for their homes. As families moved into the area, Laurelhurst began to take on the character of a community. Long a swampy extension of the shore of nearby Lake Washington and Union Bay, the Battelle site was owned briefly by a group planning to develop a golf course, which never materialized. 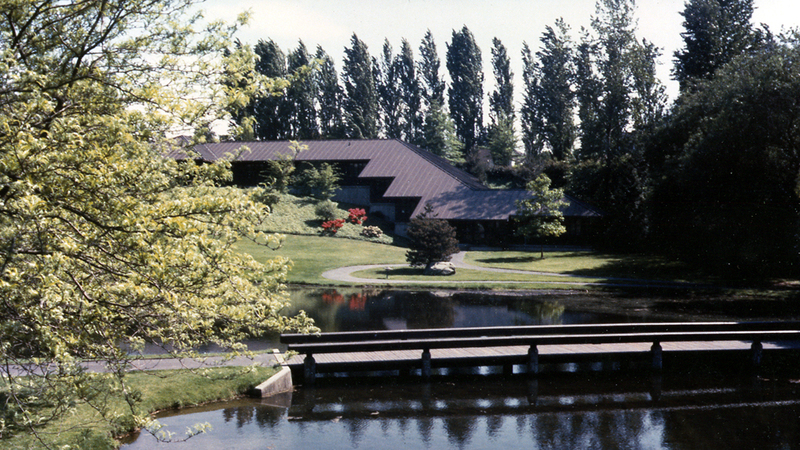 In the 1960s, Battelle Memorial Institute obtained the land to create the Battelle Seattle Research Center. In 1964, landscape architect Richard Haag teamed with architect Bill Bain, Jr. of NBBJ, Inc. to develop a plan for the 18-acre campus, which became the Seattle home of the Battelle Memorial Institute, a non-profit science and technology research group. The project was completed over two phases: four buildings by 1966; and three additional buildings and landscape improvements by 1971. 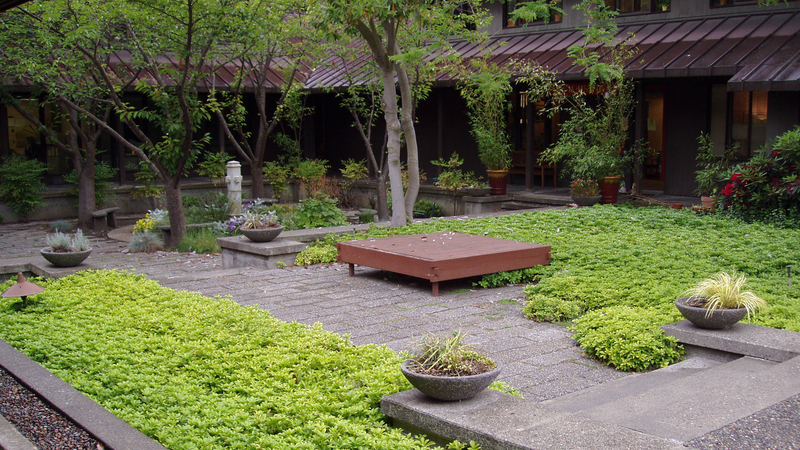 Richard Haag Associates and NBBJ were known for their early use of Modernist design principles, a style which utilized strong Japanese overtones and reflects the influence of traditional Japanese architecture and garden design. This influence can be seen in the team’s design for the campus. 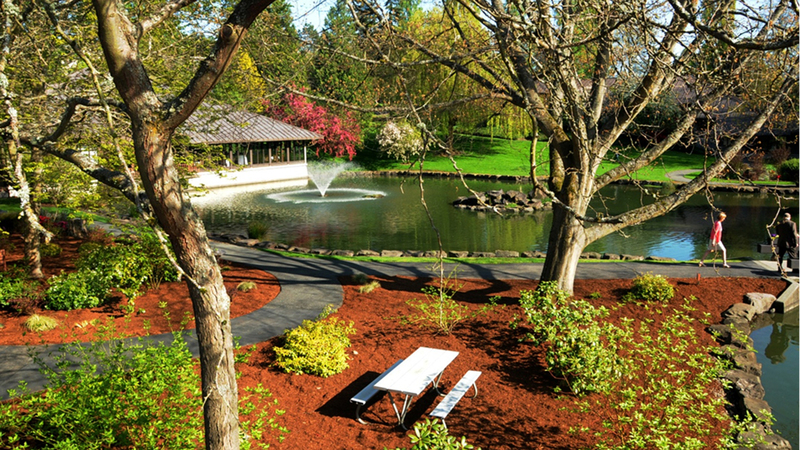 Haag’s landscape was tailored to graciously fit the site and context of the surrounding neighborhood, creating an intimate complex of open meadows, ponds with aerating fountains, winding, asphalt-paved paths and a conference center that blends comfortably with the landscape. 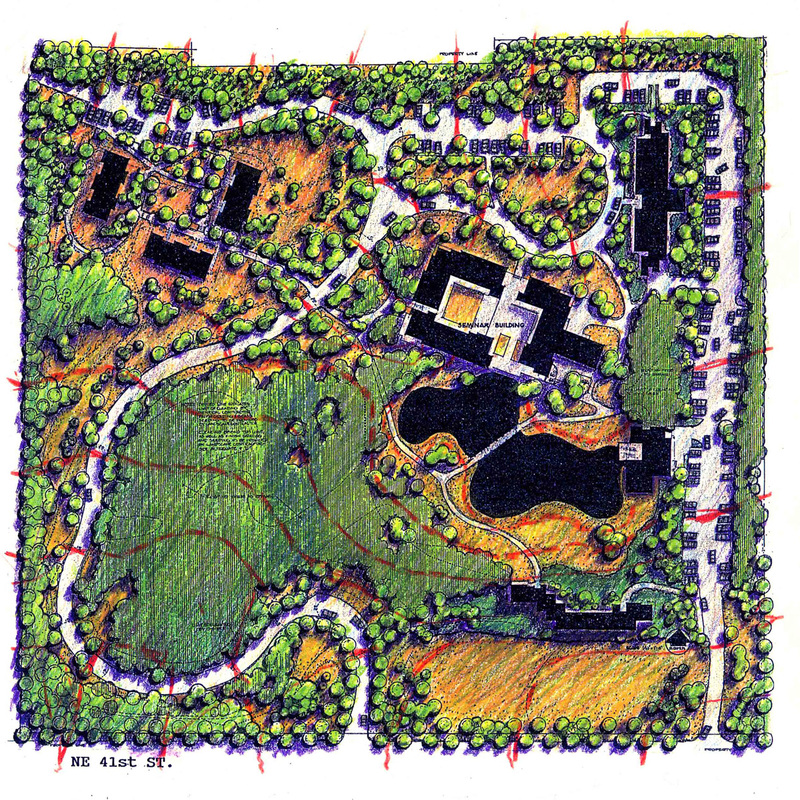 The campus design, which takes advantage of the site’s unique bowl-like topography, is organized around a central pond, clustering and focusing buildings at the water’s edge, then becoming more park-like as one looks toward the site’s perimeter, where in 1991 additional plantings of evergreen and deciduous trees added to the sense of seclusion. The design won the Merit Award of the American Institute of Architects in 1967, one of 13 AIA awards bestowed on Haag during his remarkable career. 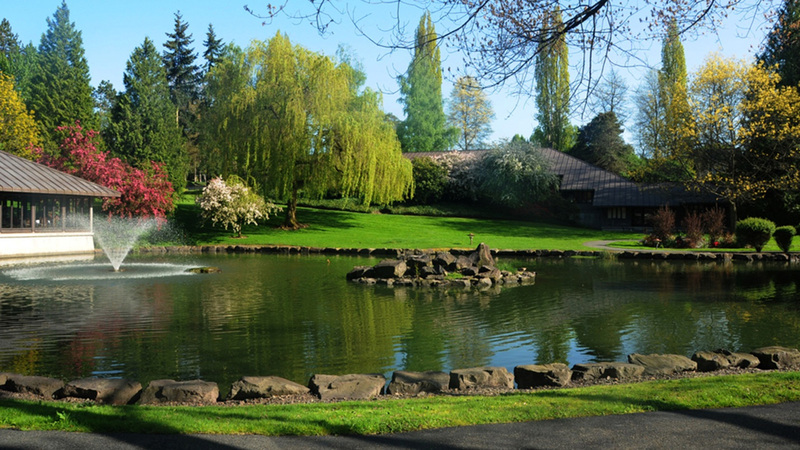 Since its creation the campus has been well maintained by its owners, currently Bruce and Jolene McCaw of Seattle, who have allowed the landscape to mature while retaining its original natural vitality. A popular strolling destination for local residents (by covenant with the Laurelhurst Community Council, the site is open to public access), the site has also become the nesting ground for migratory American eagles, who established a colony there in 2007. Unfortunately, in 2012, contrary to their earlier patronage, the owners informed the community that the non-profit research uses for which the campus was designed are “increasingly less viable.” They have proposed two plans that call for a significant increase in the amount of housing the site presently accommodates (existing housing includes units for long-term resident scholars, summer research associates and an overnight lodge). The owners’ proposed “Low Impact Plan” would allow construction of 17 4-story buildings, mostly rental units, totaling 155,500 square feet. The alternative, the community has been told, would be to build 90 single family units totaling 270,000 square feet. Both proposals call for the demolition of original structures and substantial loss of open space. The plans have evoked considerable concern among neighbors and preservationists. The community is intent on keeping the pastoral atmosphere, and led by the Friends of Battelle/Talaris, has nominated the site for City of Seattle landmark status as an example of sensitive and sustainable design, and a masterpiece of Haag’s oeuvre. They argue that Battelle/Talaris is a historic resource, which has greatly enhanced the life of the neighborhood, city and region for decades, and should not be lost to incompatible development. After a series of owner outreach meetings, the developers have begun to address the community’s preservation concerns; however preservationists want to ensure that the public continues its involvement in the design review process. The complex is insulated from the residential grid by a border of towering cottonwoods and Lombardy poplars. Native species are planted throughout the campus, including willow, cherry and Douglas firs. The design, which illustrates modern land use principles, integrating landscape architecture, architecture, and environmentally responsive planning, has remained intact through the years, retaining its character-defining features. 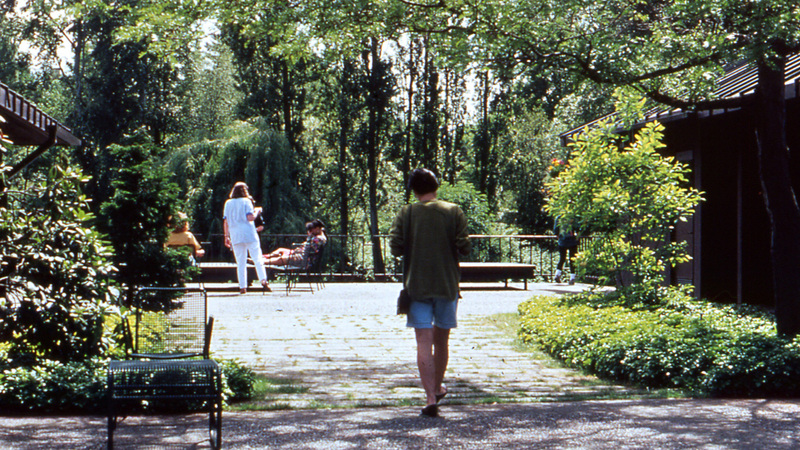 It provides an urban refuge in the middle of Seattle, and along with Gas Works Park, Steinbrueck Park, and the Bloedel Reserve is a significant example of Haag’s work. To get involved please contact the Friends of Battelle/Talaris through their Facebook page.